No tears for this brave girl after receiving her shots! August is National Immunization Awareness Month, and hopefully you're aware that charlotte+asher is a huge proponent of immunizations since each bag sold helps provide life-saving vaccines to children in need. This month we've teamed up with the CDC to provide more insight into the importance of vaccinations. We'll be highlighting a different topic each week, so be sure to check back! 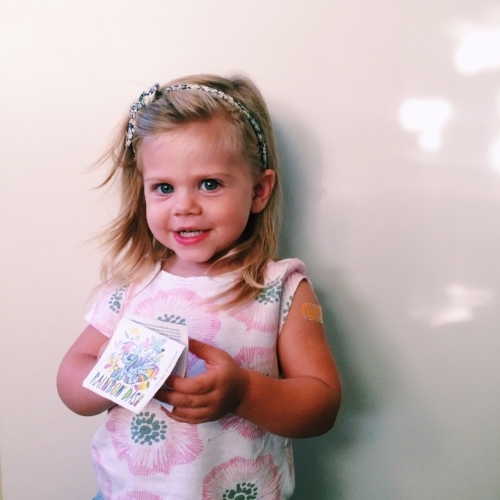 For now, here are Five Important Reasons to Vaccinate Your Child. Immunizations can save your child’s life. Because of advances in medical science, your child can be protected against more diseases than ever before. Some diseases that once injured or killed thousands of children are no longer common in the U.S.--primarily due to safe and effective vaccines. Polio is one example of the great impact that vaccines have had in the United States. Polio was once America’s most feared disease, causing death and paralysis across the country, but thanks to vaccination the United States has been polio-free since 1979. Due to continual worldwide vaccination efforts, Afghanistan and Pakistan are the only two countries in the world that have never interrupted the spread of wild poliovirus, and only small pockets of polio still exist in these countries. Vaccination is very safe and effective. Vaccines are only given to children after careful review by scientists, doctors, and healthcare professionals. Vaccine side effects are almost always mild such as redness or swelling at the site of the shot, but this is minimal compared to the pain, discomfort, and risk of injury and death from the diseases these vaccines prevent. Serious side effects following vaccination, such as severe allergic reaction, are very rare. The disease prevention benefits of getting vaccinated are much greater than the possible side effects for almost all children. Immunization protects others you care about. Children in the U.S. still get vaccine preventable diseases. In fact, we have seen resurgences of measles and whooping cough (pertussis) over the past few years. For example, in 2014, there were 667 cases of measles in 27 states, the greatest number of cases since measles was eliminated in 2000. The following year saw measles cases as well. During 2015, 147 people were part of a large, multi-state measles outbreak linked to an amusement park in California. Almost one in 10 people who became sick with measles in this outbreak were babies too young to be vaccinated. While some babies are too young to be protected by vaccination, others may not be able to receive certain vaccinations due to severe allergies, weakened immune systems from conditions like leukemia, or other reasons. To help keep them safe, it is important that you and your children who are able to get vaccinated are fully immunized. This not only protects your family, but also helps prevent the spread of these diseases to your friends and loved ones. Immunizations can save your family time and money. A child with a vaccine-preventable disease can be denied attendance at schools or daycare facilities. Some vaccine-preventable diseases can result in prolonged disabilities and can take a financial toll because of lost time at work, medical bills or long-term disability care. In contrast, getting vaccinated against these diseases is a good investment and usually covered by insurance. The Vaccines for Children program is a federally funded program that provides vaccines at no cost to children from low income families. Click here to find out more about the VFC program, or ask your child’s health care professional. For more information about the importance of infant immunization, visit http://www.cdc.gov/vaccines. This document can be found on the CDC website here.